The charming little yachting and fishing community of Puerto Aventuras draws visitors from all parts of the world. With its beautiful waters and full service marina along with the golf course that winds between its streets, Puerto Aventuras is a peaceful, safe and relaxing destination. Once you enter this gated community, there are privately owned villas and luxury condos as well as residence clubs, large and small resorts and rental properties of all shape and size. It is a wonderful location for those who may wish to experience Mexico for the first time without staying in an all-inclusive as Puerto Aventuras is extremely secure and a great choice for families with younger children. This is a beautiful little hotel (with 30 rooms), nestled along the coast in PA. Each room has its own private balcony or patio with a whirlpool and hammock, with views of either the garden, marina or ocean. There are two large connecting swimming pools along with a shallower pool for children at this picturesque resort. There are also four on-site dining options or you can visit the many other restaurants throughout the community. This 305 room all-inclusive resort located inside Puerto Aventuras is part of the Dreams chain of resorts. Sitting on a secluded bay, this resort and spa also has its own Dolphin aquarium with dolphins and manatees for its guests to visit and swim or kayak with. This resort provides enjoyment and relaxation for the whole family, regardless of age or activity level. Tours and adventures are at your fingertips, whether you like fishing, scuba diving, snorkeling or just pleasure cruises. They also have their own private section of soft sandy beach (a rare commodity within PA). 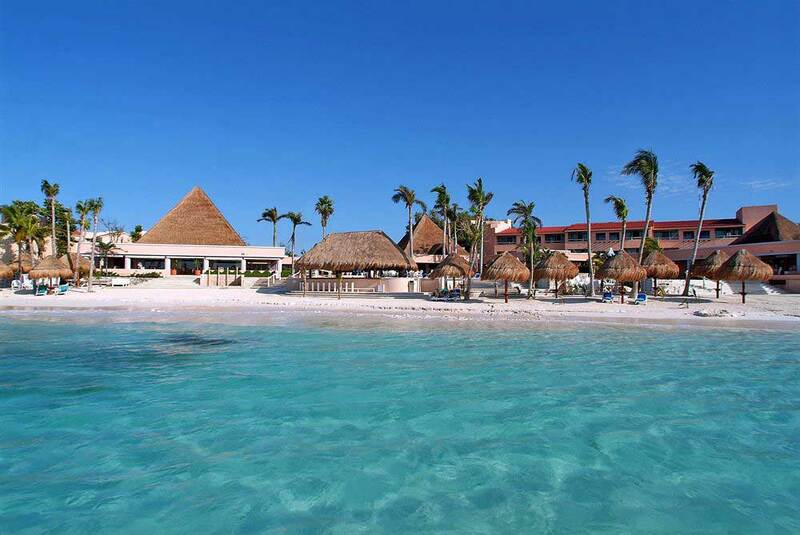 The Hard Rock Hotel Riviera Maya is situated on the north end of Puerto Aventuras. One of the most noteworthy aspects of this resort is the top-notch service and the attentiveness of the staff to their guests. They realize it’s your vacation and they work hard to make it memorable; which you don’t always get at a large resort. This all-inclusive resort caters to families as well as couples, with separate facilities for both groups. Deluxe dining and recreation, spa services along with stunning vistas are all available during your stay at the Hard Rock. TIP: Special packages include DJ and music lessons or the chance to shoot your own music video! This is a giant beachfront resort that is located on the highway just south of Puerto Aventuras. It is really 4 hotels in one package. 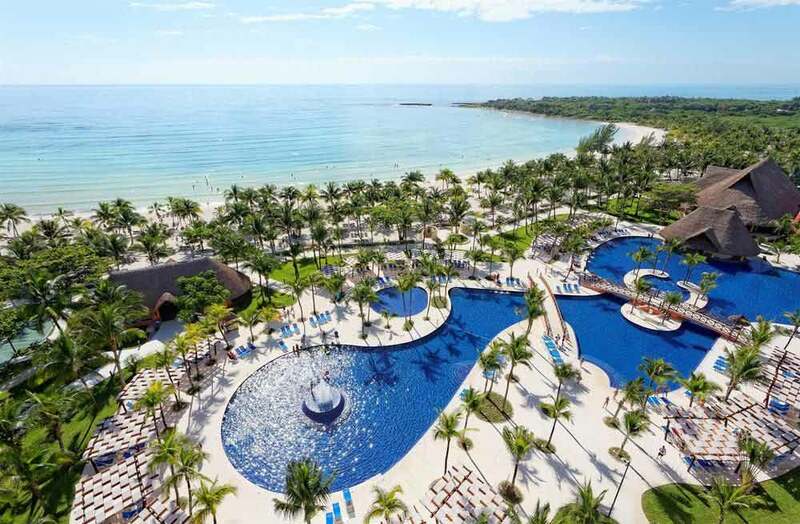 Barcelo Maya Beach, Caribe, Colonial, and Tropical are all made available to you along with their amenities regardless of which one you book. This is a good option if you are traveling with several generations of family members and you want to just rest and relax! Catalonia has a prime location in the heart of Puerto Aventuras, along with great amenities. There are 5 swimming pools where you can lounge and take in the ocean views, and 2 children’s pools. This is a popular choice for destination weddings, since it’s easily accessible, offers great service and sits on a beautiful stretch of beach in this quiet community. This small adults-only resort (formerly known as El Dorado Seaside Suites) is an excellent choice, especially for foodies. You can enjoy Mexican, Italian, and Asian cuisine at their various restaurants. The beach is narrow but private and provides enough sand, sun, and shade for you to enjoy yourself throughout the length of your stay. This resort has a very exclusive feel and is located just south, between PA and Tulum.